Just a quick note to let you know the greens aeration started today. All 19 greens had cores pulled and all cores picked up. Practice green and holes 1-14 holes todressed with sand, sand blown and drug into holes and the greens were rolled. We still have to clean up around greens from excess plugs and some extra sand needs to be cleaned up. Holes 15-18 will be be completed by around noon. Pictures and full description coming in the next day or two. We hate to see rain days in the golf business but from time to time they do occur. 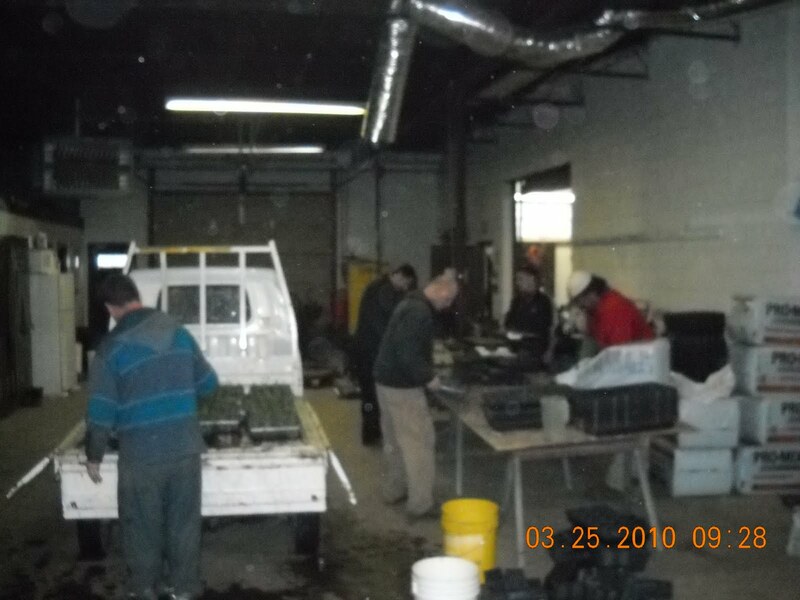 This morning we took the opportunity to transition the shop facility from winter to a more active spring facility. As you might remember from previous posts regarding the wood burning furnace, we had a piece of 6 mil poly stretched across the maintenance facility to reduce by about 1/2 the area that we needed to heat. Jason suggested we roll the poly up in place and tie it to the rafters. Good idea and saved us some time in stringing it back up again next winter. 8 tons of clay for the tennis courts have been stored in the facility to insure that they stay dry until we lay the material in early May. It had to be moved out of the center of the building and placed against the wall. A little cleaning and moving some equipment around got us to our major task of the day. Planting all of those baby plants that arrived yesterday. 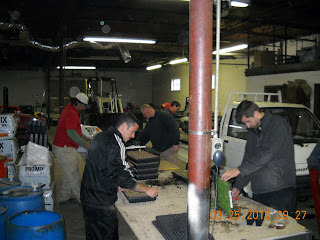 The guys went through about 3400 plants today which saved me a great deal of time. Russ watering the plants after they are potted and placed on the utility vehicle and place in the greenhouse. Jason, Skip, Mike and Tom planting in the background. A view from the other side. Asst. Mike is using a small punch to poke the plugs out of their seeding tray so Tom can plant them in their growing 6 pack tray. Some of the plugs are the size of a thimble. Asst. Skip and Jason working on the other side and Russ watering in the background. The guys commented at the end of the day that they look forward to going back outside on Friday. About 4000 plants in the greenhouse with about another 1000 to be planted on Friday. I guess I'm like an expectant father waiting for the birth of his child. Well, 3 boxes of our baby plants arrived today, 4006 babies to be exact with the remaing 1200 set to arrive in the next couple of days. I took a picture of the group sitting patiently on a standard 8 foot table in our break room. 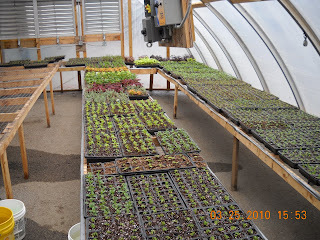 The most time consuming part of the greenhouse process is getting the baby plants in containers and put safely away in the greenhouse. 6-8 weeks of going through adolescents where it is our job to provide the right amount of water, sunlight, warmth, and pruning where they will continue to grow into young adults. Hopefully, they will not be temperamental and will follow the guidance that we provide for them. They will then be sold to our members for their gardens and or will be planted in our ornamental beds in May where they will hopefully mature to the beauty that I had first imagined back in December/January. Begonias, Impatiens, Petunias, Vinca, Marigolds, Salvia, Zinnia, Celosia, Melapodium, and ornamental pepper oh my. We started filling the ground stump areas with top soil today. We will allow the material to settle some over the next week or two. 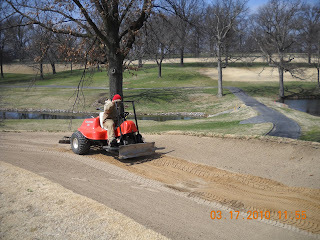 We will then smooth the area again with a finishing layer of soil and will cover with sod. Loader filling up the cart with soil. Backing up to the hole and dumping the load into the hole. The hole topped off and soil stepped in lightly. I am using a feature from Blogger that allows me to place a word or phrase in a sentence that is automatically linked to additional information on the web. The linkable word will provide assistance in defining a term we use on the golf course or explain a process/product in greater detail. A linkable phrase or word will have a font color of orange fyi or maybe burnt orange for my friends from Texas. Those of you that have been out to play the course in the last 7-10 days have probably noticed the off color look of our greens. I have explained our regulator program in a previous post and how we are trying to encourage our bentgrass and discourage the growth of the poa annua. As I was checking some greens the other day, I noticed a distinct line between the surround area that received some of the same spray treatment as the greens and the area outside the treatment area. I took a picture to illustrate how the spray affects the turf both inside and outside the spray zone. One of the benefits of having cool season turfgrass around our greens is the ability to spray products which are antagonistic to the poa annua and can injure or kill it. With millions/billions of seeds being produced on our property, poa is always trying to invade into an area where it does not currently exist, namely the newly sodded fescue areas. As we spray our greens which are mostly round in shape, we cannot shut off our 3 spray booms exactly as we cross the line between the green and surround. The spray coming out onto the surrounds provides not only added benefits in reducing poa but also can protect the turf from disease and other pests. The surround areas do receive control products for disease and insects during the season but not as frequently as the greens because the turf is at least 20 times longer which makes for a healthier, less stressed plant. We sprayed a fertilizer/micronutrient package to the greens today which should have a positive effect on the color of our greens in the next few days. In the picture below, my camera case in on the spray line between the two distinct areas next to the green. To the left of the case is the area that is coming out of winter naturally and did not receive any spray treatment. To the right of the case and adjacent to the green is the area that received treatment and shows some discoloration. Left side of 12 green/surround looking from front to back. We pulled out the walking aerifier yesterday to punch some holes in the new sod that was placed around a number of greens last fall. We also are punching some of the existing cool season turfgrass areas near the greens and the cool season tees. Reduces compaction of the soil. Allows oxygen to penetrate into the root zone. Surface water can infiltrate into the ground at a quicker rate which reduces runoff and improves playability of a given turf area. Provides small resorvoirs for water to lay in and which is then absorbed by the soil and taken up into the root system. 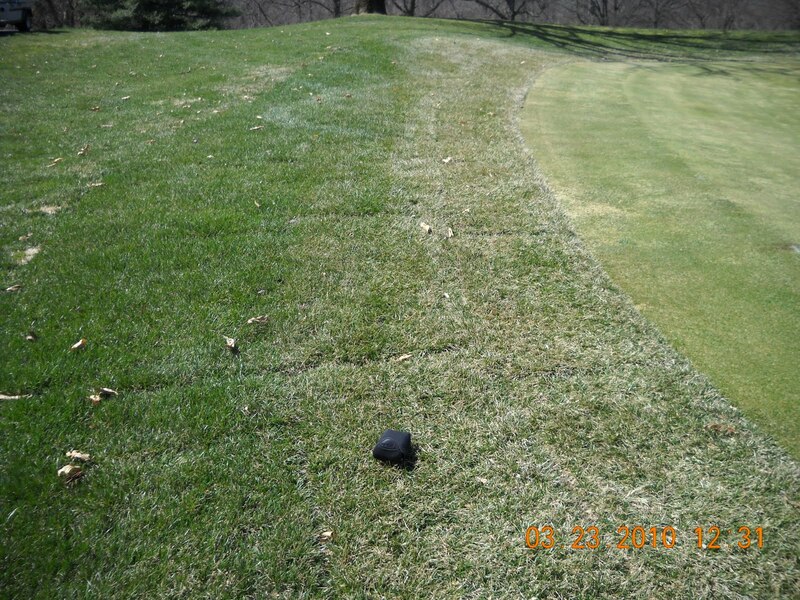 Reduces thatch and improves soil microbial population. Russ coming back up the hill on #12. Our 17th green probably has the most poa annua of any green on the golf course. I would estimate about 60-70%. The photo below is a little difficult to see but the white areas throughout the green is the poa annua that has not grown up through winter damaged turf. 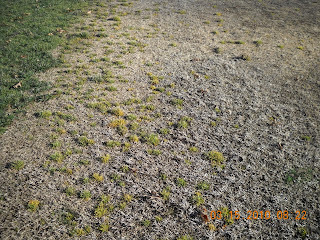 The poa is severely regulated and is attempting to grow up through the winter tip burn. We are regulating the turf to allow the bentgrass to gain some ground on the poa and to control seedheads before we have to allow the poa to come back completely. We will have to do some additional seeding working to this green in the fall since the bentgrass is rather thin in many areas of the green. 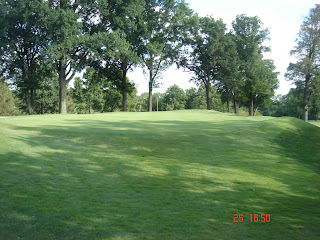 Shade is the biggest contributing factor to why this green is dominated by poa annua. Close up of the back center of #17 green. The green patches are bentgrass. August morning picture at 9:38 a.m. Shade still covereing 75% of the green. 10:54 a.m. picture. The close up area that I took a picture of has just gotten into the sunlight. 4:50 p.m. End of the day shade is ok for a green if it has had sun during a majority of the earlier part of the day. You might not believe it from the weather that we experienced over the weekend but early spring is beginning to show in various forms on the golf course. Trees are flowering and bulbs are blooming. Our rough is greening but we still have a way to go with our zoysia/bermuda. 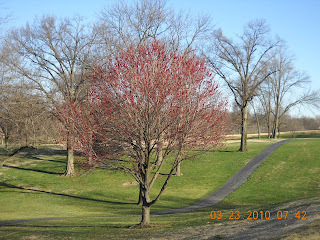 Red maple in bloom on #11. 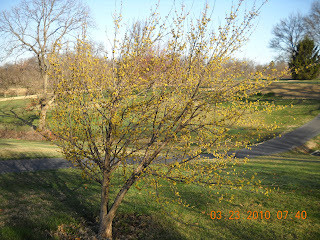 Six Cornus mas or Corneliancherry Dogwoods are blooming behind the red tee box on #11. Since we were not able to aerify our greens yesterday, we are doing a very light grooming/verticutting of our greens today. This process forces the grass blades to stand up and the greens mower then is used to mow off the blades. We will do this type of cultural practice throughout the season to help keep our turf in a more upright position which reduces the amount of turf that comes in contact with the ball. The less contact, friction or drag on the ball increases ball roll and reduces the affects of grain on a golf ball. Toro verticutting unit used on our greens. The final effect of the verticutting unit after going over the green surface. 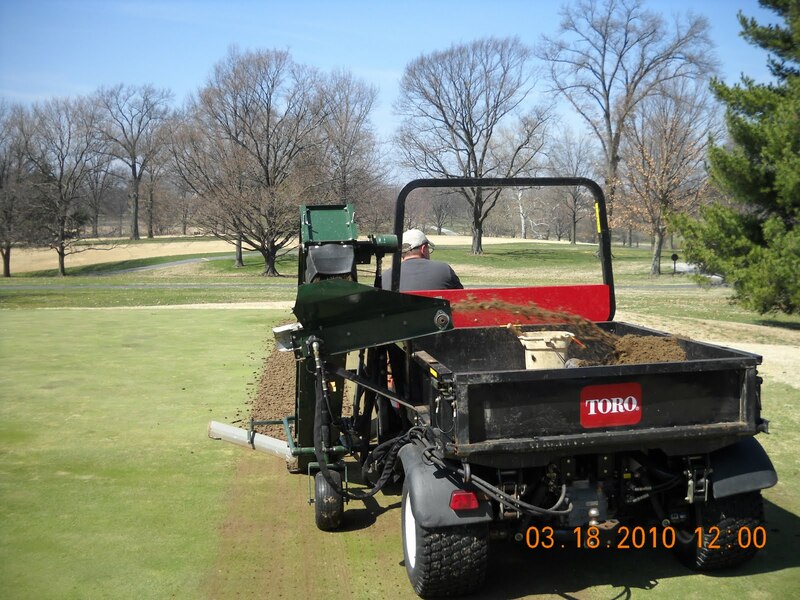 Due to rain this weekend, our greens aeration will be rescheduled for Monday, March 29. Assistant Mike spent the last 2 days charging the irrigation system. He had to put part of the pump station back together again from the recommendation of what should be removed and cleaned before the onset of winter when the station was shut down. The irrigation lines were filled all day yesterday and throughout the night by our jockey pump which is a small pump that produces a low volume of water but has the capacity to handle an irrigation hose or can adjust the pressure back to our system set point without requiring the large irrigation pumps to start. It saves energy and reduces wear and tear on the system. We allowed air to purge out of the system through a quick coupler and the key that is inserted into the coupler allowing water and or air to release from the system. Our greens have 2 couplers and our tees have an additional coupler. We also have a couple of drain outlets that flow into our lakes that help us to drain down our system in the fall and releases air pressure which can build up when you fill the system in the spring. Our system is designed to run at a water pressure of 130 psi. Air that is trapped in the system and not removed systematically as the lines fill with water can lead to air pressures high enough to damage sprinkler heads and or our irrigation pipe. 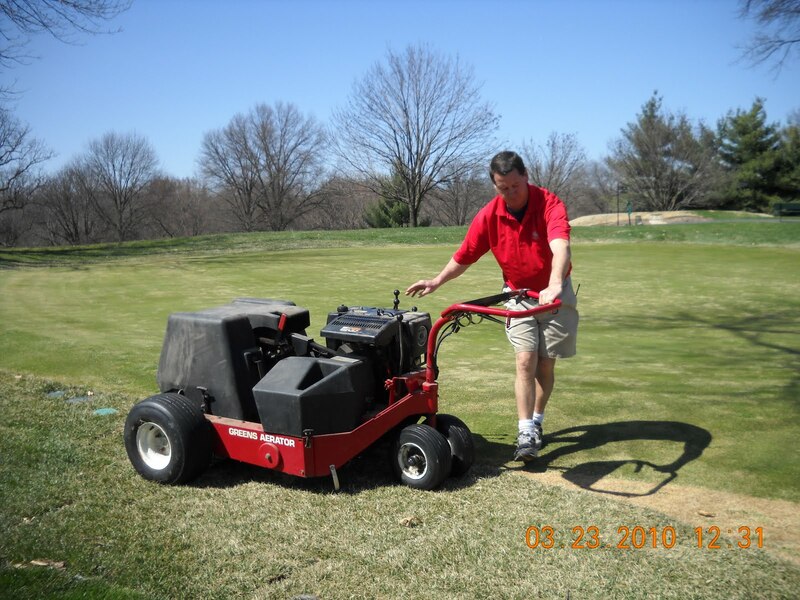 As the system comes up to 50-60 psi, heads are turned on manually through the green pedestals that you see out on the golf course at various places. Every head is wired into one of these boxes that is shared between 1-2 holes that are in proximity to one another. This is how the system is finally brought back on line. The system is being turned on this early to help us with the aeration program. The moisture helps to settle down the sand. It also allows nutrient material that we apply to begin the process of breaking down and incorporating into the green profile. 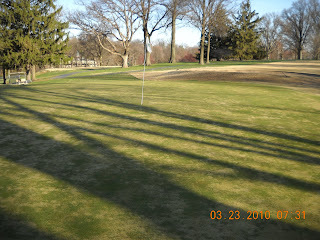 Also, the greens could dry out if it became windy and warm. We do not want the greens to be set back as they begin to heal from the aeration program. 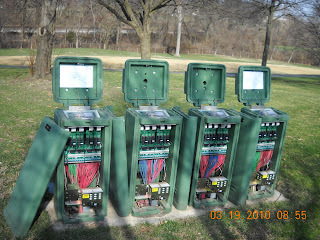 Irrigation controllers between holes # 1 and #18. A head along 2 cart path. You can see the difference in the stream coming out from the picture above compared to the air/water mixture coming out of the head below. 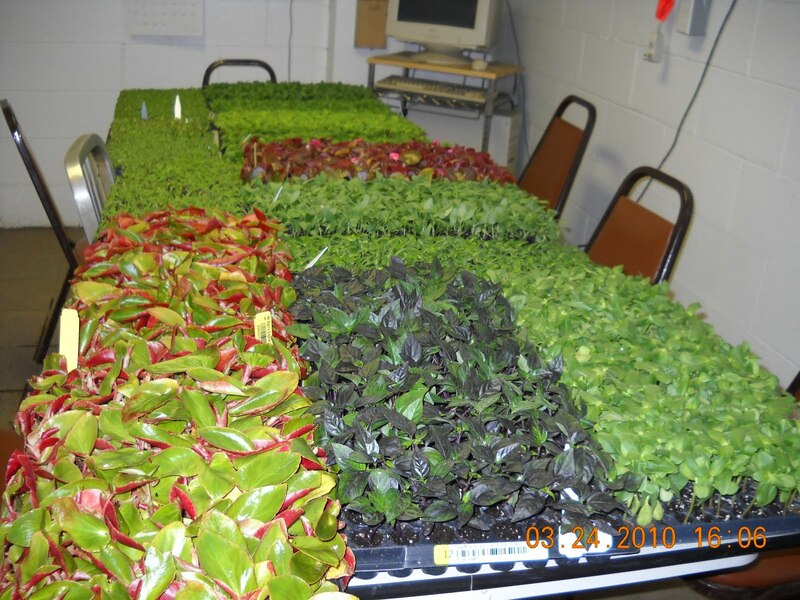 The first shipment of our ornamental plants arrived on Thursday afternoon from Michigan. A few hundred which is enough to get us started. The remaining 5300 are coming in the next 7-10 days. There will be another plant sale for our members sometime around the first of May. 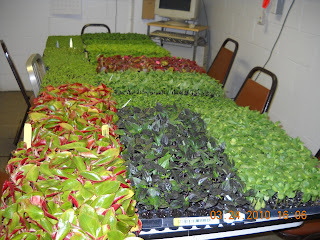 Coleus, Geranium, Sweet Potato plant, Angelonia, Bidens and Licorce plant were the first plants to arrive. 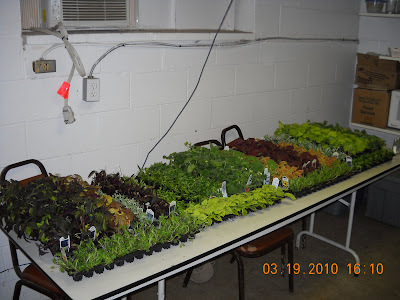 We will get them placed in their growing pots this weekend. We have had enough rain to keep the soil moist but not completely saturated. As we finished our leaf clean up late last fall, more leaves continued to drop and blow around the course througout the winter. As conditions continue to dry, we thought we would go out and do a little leaf clean up. We used the blower to move the leaves into windrows and the rough mower to chop up the leaves. 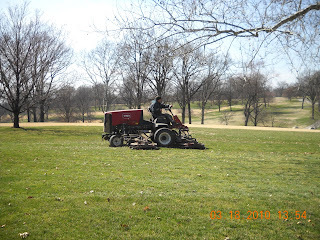 Usually, the rough mower will need to be out cutting a few areas of turf about the last week of March. Assistant Skip on the blower unit waiting for golfers to move through his area. Russ mulching the leaves with the rough unit. We plan to aerate our greens on Monday and hopefully have the process complete on Tuesday. The course will be open on Tuesday for regular play. In preparing for this process, we have to check out our equipment to insure everything is set up properly. Our nursery green has a different base than our regular putting greens so we have to do a couple of passes on the very back of a green that is in play. I would use the practice green but it is the first part of the golf course that most people see so I prefer not have it partially aerated. #4 is the green that we are using because of its easy access and the overall depth of the green which will allow us to keep the hole location toward the front for the next couple of days. We are also using our core harvester on a newer utility vehicle this season so it could be checked out as well. The new machine has a much lower PSI(pounds per square inch) weight which should reduce some of the tire imprinting that the much older 3 wheeled unit caused in past years. This will not eliminate the heaving because we are pulling cores at a depth of 6" but it should be reduced. 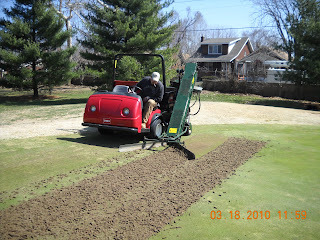 The 6" deep aeration hole will allow roots to move down into the soil layer that is at about 3-5" of depth. Each green has a varied amount of depth of sand. As I have mentioned in the past, we are topdressing our greens with a sand that is more coarse than the sand that was used for many years. The existing sand has created a very tight water holding and oxygen starved root profile which reduces the ability of the greens to drain and keeps them very soft on the surface after rain events. The holes will be filled with the coarse sand during our process which will help to provide deep channels for roots to grow and moisture to be allowed to move through the root profile. The pass on the right is at a depth of about 3". The pass on the left is full depth of about 6". You can see the diffence in material that is brought up to the surface. 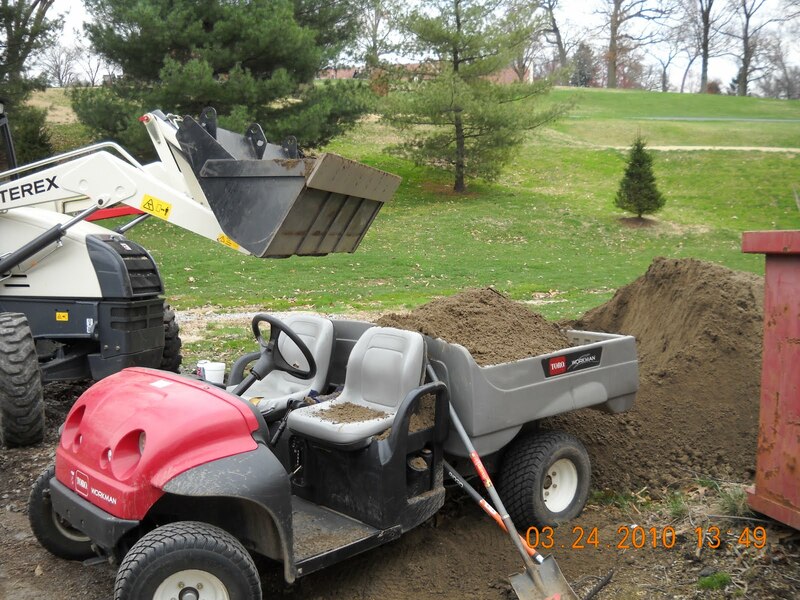 Harry who is our mechanic is testing out the core harvester on our 4 wheel drive Toro Workman utility vehicle. 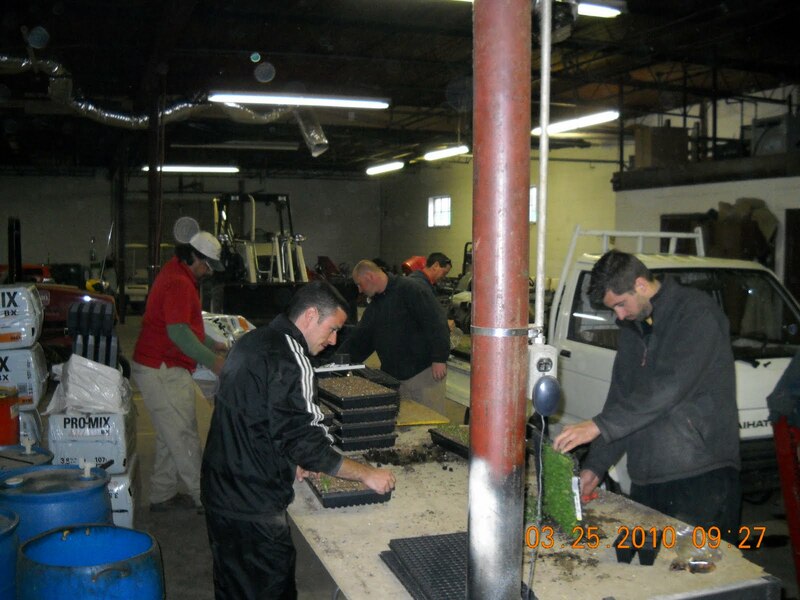 It takes all hands on deck when aerating. Harry will be out with the rest of the crew during the process. The v-guide in the front directs the material up the conveyor belt where it is discarded into the back of the workman. The setup of the unit allows you to pick up the cores without driving upon them which makes it very difficult to pickup squashed plugs. The back view of the core harvester in action. The small conveyor belt shoots the material out into the back of the workman. I will send out an email blast and make a blog post when the process is complete. Our greens will be sandy during the first few days after the process but I expect that they will play fine. I would believe the greens will be in good shape within 7 days and back to normal conditions within about 14 days. During the first few days after aeration, moisture or dew on the greens can cause sand to stick to the rollers on our greens unit and rolling unit so we must wait until the greens have dried substantially before we can place a mowing unit on the green. 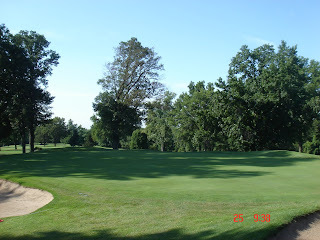 Because of the cool weather and growth regulators on our greens, they are not growing excessively as this time. The holes will be filled with sand which will allow the ball to roll out to the hole. We appreciate your consideration during what I would consider the most important cultural practice that we perform to our greens during the season. 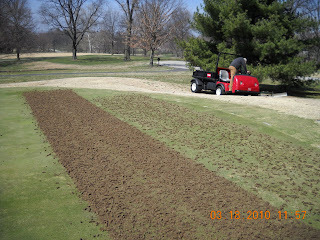 The rest of our aeration work during the main growing season until the middle of October will be of the venting type. Small tines with very little surface disruption. Last fall, we renovated the nursery area that was not being utilized near the 16th tee/2 fairway area. The area is going to be a bentgrass nursery which would then be used to replace various collars on our greens that are severely infested with poa annua. We added sand, tilled/smoothed the surface, applied a soil fumigant to remove all weeds/seeds, and seeded bentgrass into the area. We had an fair germination of the bentgrass which was then damaged severely by a 3" rain in early October. 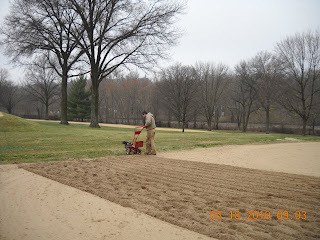 We applied a fine particled sand to the mix but the overall existing blend of sand still too coarse for growing a dense stand of bentgrass that will then be removed as sod. 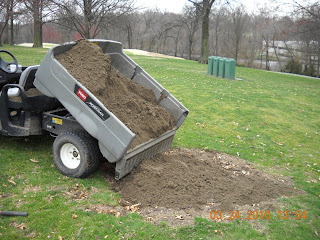 This morning, we hauled another 10-12 tons of sand to the site and spread it with our bunker rake. The sand is being tilled/blended, raked smooth with the bunker rake and will be allowed to settle for a few days by rain or irrigation. It will be seeded, fertilized and covered in the next couple of weeks. Assistant Mike tilling the fine particled sand into the existing sand profile. 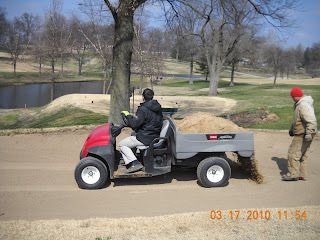 Each season, the staff adds sand to bunkers based on the overall depth of the sand in the bunker. Players and wind help to remove the sand each season. We will bring in some additional sand to add to a number of other bunkers in the next few weeks. We will use the culitivator on the bunker rake which will help to mix new sand in with the older material to help keep the bunkers consistent for our players. Assistant Mike dumping a load in the 14th bunker while Jason waits to rake and smooth the surface. Jason smoothing out the piles of fresh sand and then raking. 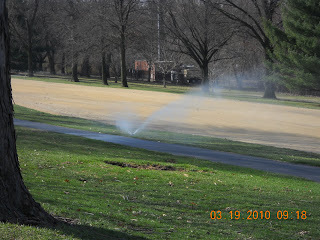 Here is an update on our RoundUp dormant fairway application that was made in February. 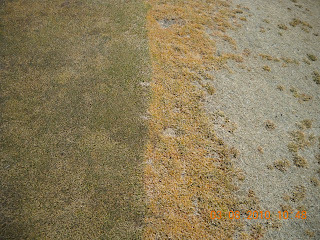 Poa plants are turning yellow and beginning to die in areas of the fairways where they emerged. As mentioned in previous posts, poa is a prollific seeder and can be very competitive in shady and or wet areas of fairways. The plants can weaken the desired species which is the zoysia that we want to protect and encourage to grow. Right side of #17 along the intermediate/fairway cut. 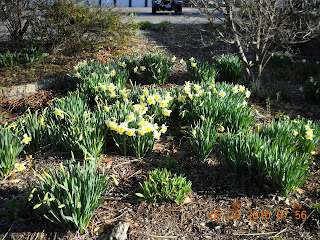 Its time to get the ornamental planting beds spruced up as the perennials begin to pop their heads out of the ground for the season. We use power pruners to cut all the stalks and dead plant material away from the base of the plants before they get too large. 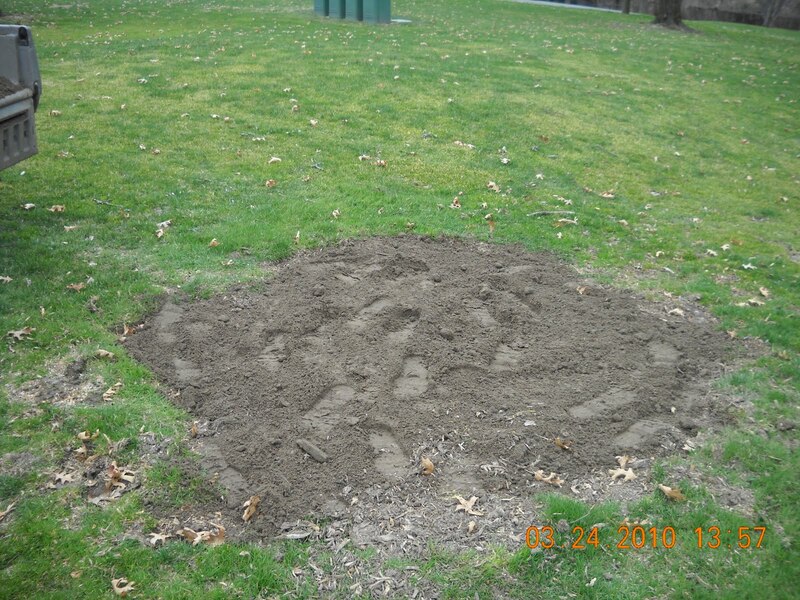 A rake and blower assists in removing the dead plant material and oak leaves that seem to gather in almost every bed. 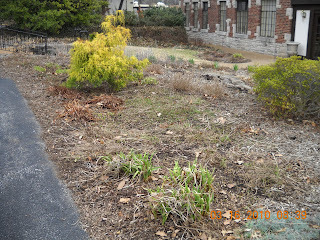 As you know, some perennials can become invasive and move out of their assigned spot in the hierarchy of plants. We will be rejuvinating a couple of the beds, especially in the member grill entrance, sunroom and patio area of the club. Achillea and Daisy's have multiplied, divided and conquered a little more space in the grill planting than I would like to see. 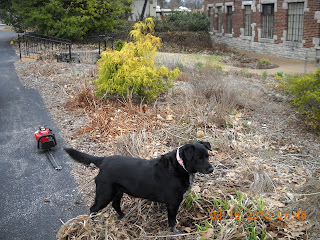 We also have some invasive plants that have come into a couple of our beds either from the mulch or some plants that were placed in the garden a few years ago. These invasive plants have required many hours of weed pulling to remove them from the bed. I will be making some selective chemical treatments to help control the weeds before the desirable plant material gets too large and could be damaged from the spray. Ornamental plantings need some revitalizing every few years. 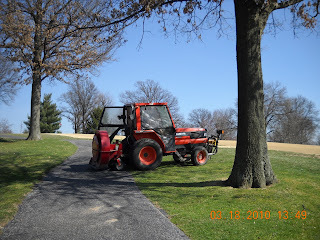 We will be fertilizing, preemerging and will place a light cover of mulch in place for water retention and weed prevention over the next few weeks. Ladybug checking out my handy work and looking for a vole(mouse) that sometimes can invade our plantings. The aftermath of raking, hand pulling and blowing. I will add pictures as the improvements continue to be made. 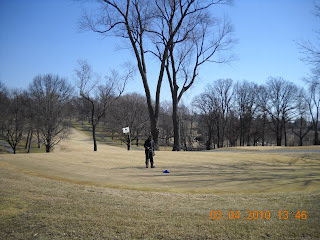 Friday morning I walked in circles around all of our greens marking the widths of our collars. As I had mentioned in a previous post, the greens mowers will be scalping into the collars until we have the collars at the proper width for the season. We have a device below made out of two pieces of threaded rod. The handle part is bent for ease of walking the straight piece is welded together at the bottom to give us the 30" width. 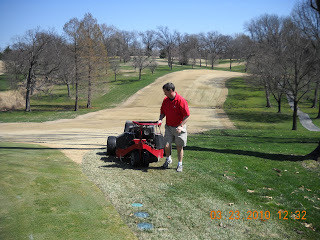 We then use a marking paint wheel on the inside to mark the mowing path that the green mower should follow. 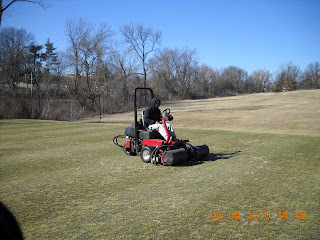 We will continue to dot the areas for the next few weeks to make sure we are keeping the proper width and will monitor it from time to time during the season before the heat of summer arrives when we do not want to do any scalping of turf because of its inability to recover. That's the question many superintendents are pondering at this moment. 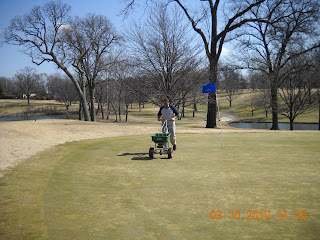 When should I apply the control products to my greens to reduce the effects of poa annua seedheads? (Click on poa annua for great power point regarding this weed) One of the great benefits of bentgrass which is the plant that we want to be the dominant species on our greens is that it does not form seedheads at green heights of cut. Poa annua on golf greens can continously produce seedheads from the beginning of spring until temperatures near 90 begin to invade our area in June. Greens being cut under .125" can become very bumpy from this prolific seeder. Verticutting, grooming, sanding, and dragging greens can reduce the impacts of seedheads slightly but the most effect seedhead control comes from Plant Growth Regulators which prevent the seedhead from forming in the first place. We use a combination of two Plant Growth Regulator chemicals which does reduce the amount of seedheads to a more acceptable level than not applying the products at all. This combination spray is variable in its working ability but is less harmful than other regulators which can effect the bentgrass more severely by discoloring and possibly thinning the turf. Rough height poa in full seedhead glory! We use a model for growing degree days to help us determine the best time to apply our products. Growing degree days are determined by the measurement of daily average air temperatures. Farmers, horticulturalists, and superintendents utilize past research which has studied how temperature affects certain weed, insect and disease pests. A specific cycle of life of a pest is signaled when a cumulative number of growing degree days are reached. i.e. Poa annua forming seedheads. We have been monitoring a website which is assists us in measuring growing degree days. Growing degree day models use scientific research and studies which help to determine when seedheads will begin the process of forming within the crown of the plant. Proper timing of applications equals the best opportunity to be effective at managing the production of seedheads. measured and is then subtracted from a base temperature model. There are two base models used depending upon the intended pest that you are trying to control and the product you are wanting to use. The models are based on 32 and or 50 degree temperature base. 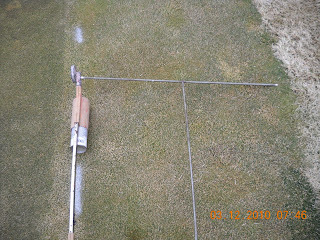 We are using the 32 degree model for our Primo/Proxy regulator application. Below is an example of how we determine the growing degree for a specific day. We then add 25 to the total number which has been accumuating since March 1st. At this time, our current growing degree model is showing Cahokia, IL which is the second dot from the bottom of Illinois at around 148 growing degree days. Our model calls for our spray application to be made around an accumulation of 200-250 growing degree days or slighly sooner based on research recommendations. We had intended to make our application on March 12th but with rain in the forecast could reduce the effectiveness of the application. We will be making our first application this Monday based on this model and must do a repeat application in 3 weeks to give us the best control possible. One of the products we are using takes 7-10 days to become fully active in the plant. The trick to get the best control is to insure that seedheads have not begun to form in the base of the plant. If it has, we have missed the initial window but will still get some control. It is important to be slighly early than late according to research recommendations. Also, a plant will produce many seedheads during the spring season so goes the ability to get some control if the earliest window is missed. In an earlier blog, I mentioned a growth regulator for slowly reducing the amount of poa annua in our greens This material will also help to reduce the effects of poa annua seedlings that do germinate by reducing its growth and keeping it tighter to the canopy of the green which will allow the ball to roll more smoothly. I found an interesting article in the USGA archives talking about poa annua and how it was being eliminated back in 1927 on a particular course. Click on the USGA link above for an interesting read. We've been fighting this weed for a long time. During this process,, you might notice some greens that have less poa seeding such as 2, 3, or 11 because their overall poa population is much less than greens like 1 or 17 which are more heavily infested. Our first spray and broadcast speader applications were made to our greens this week. When the turf begins to green at the end of winter, cool weather diseases begin to show up on our greens. I always like to do a simple clean up application at this time to protect the plants from disease that has lingered from the winter or beginning to develop. We also apply a growth regulator product called Trimmit which we are using in an attempt to reduce the amount of poa on our greens and this product also reduces the growth rate of the turf as well. We made multiple applications in the fall and will make mulitiple applications this spring. 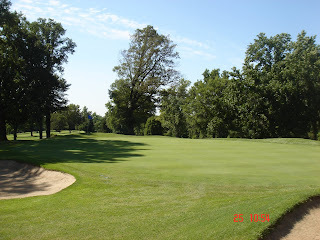 We will reduce our rates in the spring to insure that we do not have a major loss of poa. 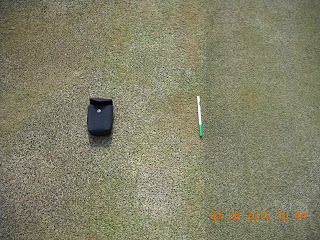 The effect that we are trying to achieve is to give the bentgrass the competitive advantage over the poa. We want to see the bentgrass begin to become more prominient and fill in a single blade at a time in high concentration areas of poa. We also are incorporating new bentgrass seed into the turf surface in the fall to help place more bentgrass plants in areas where there are very few. 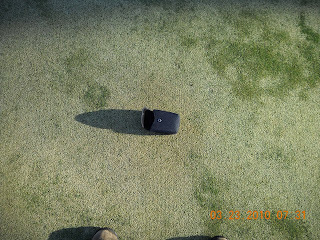 Our greens average anywhere from 10% poa to some greens with 50-70% poa. A loss of even 5-10% of the poa on a 25-50% poa contaminated greens could be catastrophic not only for the green but on me as well. Slowly but surely is the way to go with this program. The extremely wet weather over the last two seasons has not helped this program. Poa loves moisture and cooler temperatures plus with the trees on our golf course, we have a tremendous seed bank of poa seeds being produced each season. As the bentgrass begins to gain the competitive advantage, we will do some preemergent applications in the late summer to reduce poa germination. We also made an application of a granular fertilizer this week to assist our greens in their effort to green up. This will also give the greens a boost of energy going into our greens venting program which is planned in less than two weeks. Well, its been just over a year now since the blog was started. First, allow me to apologize for the misspelled words and the bad grammar that is thrown in from time to time. It seems no matter how many times I proofread or spell check, an error jumps off the page at me after I've already hit the post button. I've read the post to myself three times and outloud twice to no avail. Here are some interesting statistics from the last year. We've had over 1900 unique visitors since I've been running the stats counter at the end of November 2009. Individuals from over 20 countries have viewed our blog. It is great to know that our blog has inspired some of my fellow superintendents to start a blog just as others inspired me to do the same. Maybe some twittering is in our future for the tech saavy member. The thanks that membership has shown toward this publication is greatly appreciated. We will work as hard the second year as we did the first to provide you with current information about the many practices that take place at this great golf course. Well, its time to get busy on the next post! 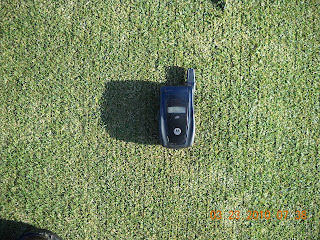 Our collars which are the first cut next to the green surface, are mowed at 3/10" during the season and are 30" wide. The mowing height of our bentgrass approaches are the same height but are much wider than the other 3 sides of the collars. After a season of operation, the collars have a tendency get larger. We ask the the greens mower operators to be careful and now scalp into the collars because of their inability to recover quickly. As they continue to make these circles every other day during the season, the collars expand. Each spring, we use our green mowers to narrow our green collars back to 30". The greens are mowed at approximately .125 which is approximately 60% lower than the collar. As you mow the collar at a cut that is taller than the greens, the crown of the plants grows at a higher point than it would at green height. (The crown is the point in the plant that I call the growth center. It is the location of the plant where the leaves and roots form.) When we cut any plant much lower than it normally grows, scalping occurs and the crown is usually injured. It will need time to recover. The cooler time of spring assists the plant in recovering from injury. As we continue to mow the area at green height, the crown of the plant adjusts to a lower point so it protects itself from further injury. This can also occur in your home lawn if the mower height is lowered significantly. During the season, you might notice some paint dots along the collar and green which identify where the operator should adjust their cut either to the inside our outside. There are some greens that will only need an inch or two adjusted but other sections that might need more significant adjustment made in the green surface. The picture below is from #5 and illustrates what we are attempting to do. To the right of the ink pen is the green height bent. To the left of the green to the camera case is the area that has been scalped. There is at least 12" of the collar that we are trying to reclaim to green height. The picture below is the approach of #8 where we sprayed the poa that has been growing and attempting to smother the zoysia that is dormant. 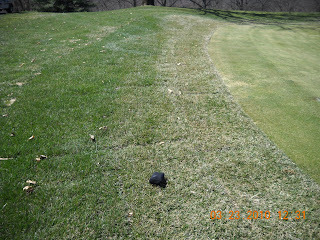 This area was sprayed in late January after the thaw and just before the cold and snow hit the course. The warmer weather has allowed the RoundUp to do its work to the plants. We will be monitoring these areas to insure that the zoysia grass is still alive under the poa. If it is not alive, we will strip out the area and put new zoysia in its place. I expect most of the zoysia to be in good enough shape to survive and thrive. 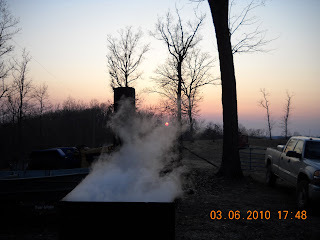 The last of the maple sap was boiled down Saturday. My brother made an evaporator many years ago in shop class. It is wood fired. I went out to his place on Saturday afternoon and started the process of boiling down 100 gallons of sap. The container held about 60 gallons at a time so we had to boil down about 50 gallon before all of the product had been dumped into the holding/boiling container. It took about 8 hours to boil the material down to 9 gallons which would be finished on Sunday. I ended up giving him a few gallons of the product for him to finish since he provided me with the taps and the boiling equipment. I brought the remaining 6 gallons back to Glen Echo. I boiled down the remaining material to about 2 gallons and then Chef Rob and staff finished it off to about 1 1/2 gallons or so. We ended up with about 4.5 gallons of finished product this season. 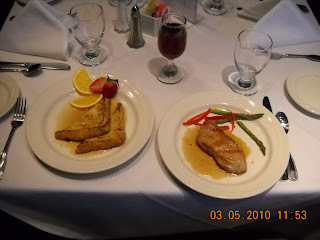 Its my understanding that the Chef had a Pork Medallion special which had Glen Echo's homemade Maple Syrup as part of t glaze/sauce Saturday night. 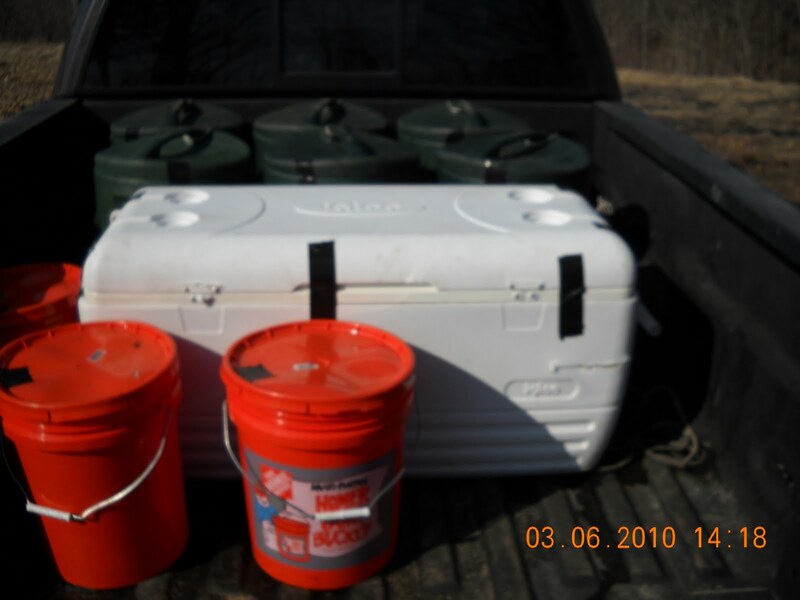 Water coolers, large white cooler and buckets full of sap waiting to be boiled. The evaporator full of sap waiting for the heat to come up. The container is about 2'wide, about 4' long by about 1' deep. The sap coming to boil. Brother Delmar and a great view in the background. Getting near sunset with the sap boiling in the foreground. Chef Rob and the kitchen staff finished off our second batch of homemade maple syrup in the kitchen on Thursday boiling down the remaining 4-5 gallons to 1 1/2 gallons of finished product.. I went up this morning and got a taste of the product, yummy. 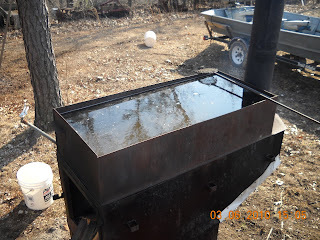 My brother has an outdoor stove that he has used in the past to make maple syrup. It has a wood firebox on the bottom which heats up the sap. The sap is held in container that sets into the unit for boiling the water out of the sap. 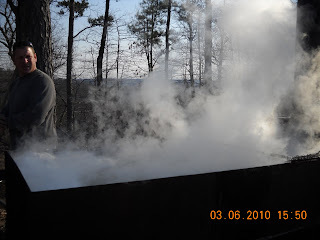 This is the recommended way to make syrup because it saves on propane costs and also gives the syrup a smokey flavor. I hope to get another batch boiled down this weekend using his stove. That might finally be the end of our production for the season. 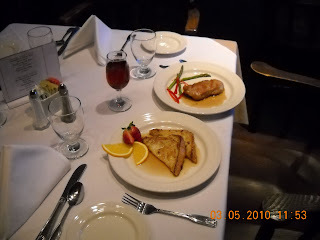 I've attached a couple of videos from You Tube which shows the making of maple syrup in Wisconsin. A little larger scale operation than Glen Echo. The greens have been mowed, holes have been changed, bunkers have been raked, cool season tees have been mowed, collars and approaches will be mowed Friday morning. All we need is you to begin the season. Looks like some average to above average temperatures for the next few days. We look forward to seeing more members taking advantage of the best weather of the year so far. 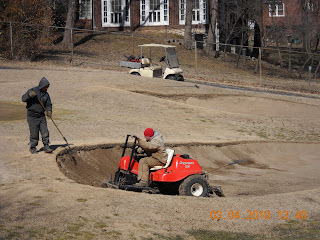 Russ and Jason pushing up the bunkers and raking. Tom mowing the cool season tees. Assistant Mike changing the holes. The staff had to use the backhoe today to remove a water meter that measures the water that fill the irrigation lake on #15. The meter was buried about 3' deep and was at the bottom of 2' wide drainage pipe which helped to form a pit so the meter can be checked. Glen Echo member Dave Adam has been working with MSD for a few months in an attempt to get a reduction in our sewage bill which is based on our water consumption. The clubhouse and lake fill uses the same compound meter to measure the use of water. MSD has given us a % reduction in our bill over the years. 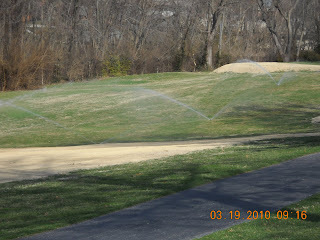 With the installation of the new irrigation system, we believe that our water usage for the golf course has potentially increased. MSD must do a survey for a full year to verify that we deserve a reduction in our bill. 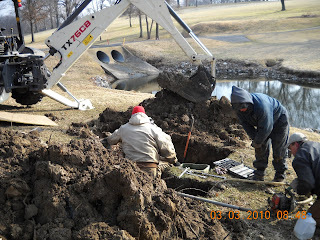 The meter must be calibrated and verified by a pump company, so goes the big dig on #15. The pile of dirt will be there for a few days until the company can do the work to verify the accuracy of the meter. Once that takes place, we have to install the meter and then backfill the hole. 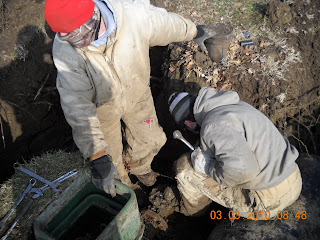 The picture below shows the staff in the hole removing the 1" sized nuts and bolts so the meter can be disconnected from the pipe and removed for calibration. Assistant Mike and Jason down in the hole doing the dirty work. Russ got his feet in the muck later in the project. Most of the bolts had to be snapped off to remove. 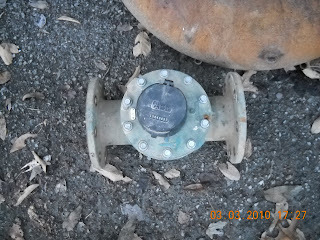 Here is the picture of the 4" cold water turbine meter after it was pulled out of the hole.